Business and Professional Women (BPW)/St. 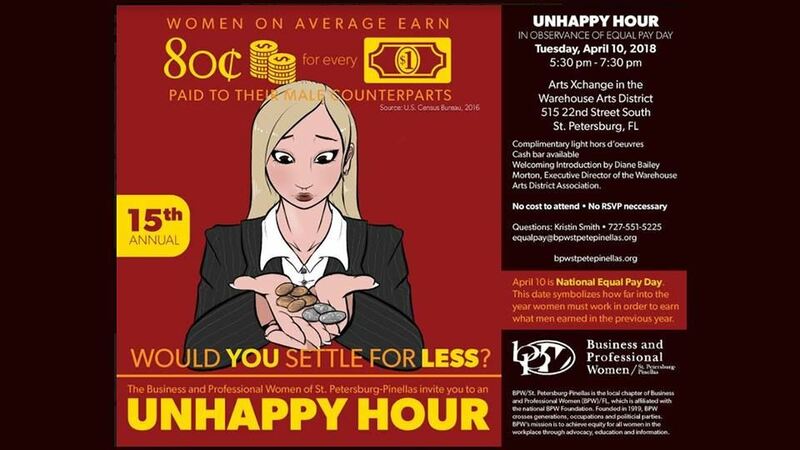 Petersburg-Pinellas will hold its 15th annual “Unhappy Hour” on April 10, the symbolic day that the average woman in the United States finally earns the same amount of pay that her male counterpart earned in the previous calendar year. According to data released by the U.S. Census Bureau in September 2016, the average woman makes just 80 cents for every dollar a man is paid, reflecting a gap that results in hundreds of thousands of dollars in lost wages over the course of a career. Therefore, if a man was paid $50,000 to perform his job from January 1 through December 31, it will take a woman in the same position, on average, until April of the following year to earn the same amount.